We are quite a small branch, so we're always keen to meet new people who are interested in becoming volunteers. What could you do to help? Well, do any of the following describe you? - Do you love cats and want to help them find loving new homes? - Are you caring, but not overly sentimental? - Are you not afraid to get your hands dirty, happy to deal with the public, and do you understand that cats in care need attention outside of normal hours? Yes? Then maybe you could be a FOSTERER! A fosterer's role is very rewarding; it's about looking after cats while we find them a loving home. Fostering is done at home - either in your garden in a purpose built cat cabin (which of course will be provided to you) or in a spare room adapted for indoor fostering. - Are you motivated, do you enjoy helping at events, are you full of fun and interesting ideas for fundraising events? Yes? Without our FUNDRAISERS and regular events, sales and original fundraising ideas, we could not continue our work, caring for cats and kittens. There are lots of local events and venues in the area where we can raise awareness and raise funds for our worthwhile cause. Activities involved include coming up with ideas for venues, persuading people to volunteer goods to sell, and manning stalls. 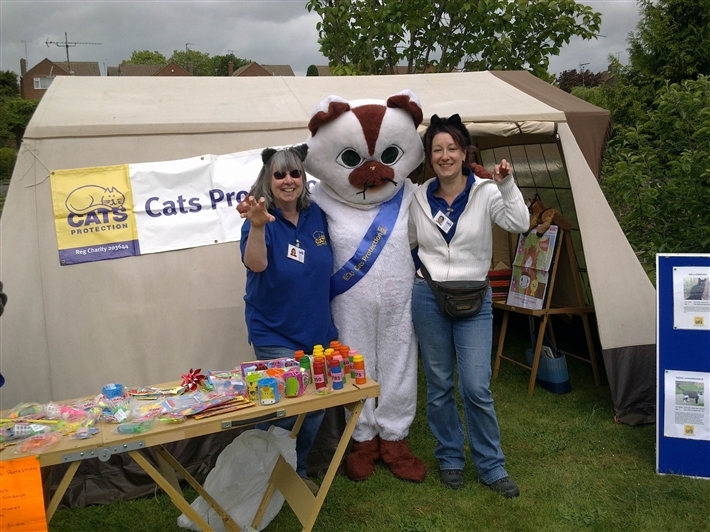 Answering queries from the public about feline welfare, lost cats and adoption while raising funds is a central part of a branch/adoption centre's frontline fundraiser’s work. - Do you just want to make a difference, to ensure all cats are homed to the right places, or do you have transport and a few hours to spare? - Maybe you just love animals and want to use some of your spare time to benefit cats and kittens in your area? If we have any specific roles that we need volunteers for at the moment they will appear at the bottom of this page. Interested in finding out more about how you could help out? Then please call us to discuss what you could do.